Big screens are nice. But sometimes the extra real estate isn't worth the lack of portability. If tablets are considered mobile devices, they should be easy to take with you, right? That's the idea behind a new class of small tablets with screens measuring roughly 7 inches diagonally. Over the last six months, some really, really good products have come out in this category. In a test of four big ones, we found high notes, low points, and a clear overall winner. We gathered up four of the top small tablets of 2012 and used each of them for weeks. We synced up our accounts, then downloaded apps, books, magazines, and movies. We used them, basically, as if we owned them. We did our standard battery rundown test: endlessly streaming Nyan Cat over wi-fi, screen on full, volume at half, Bluetooth off. We feel strongly that real world battery testing is more important, but the rundown test gives us a more objective metric to factor in. For each tablet we tested the cheapest, Wi-Fi only option. Note: Each of these tablets has its own standalone review—click the product's name to read it. The rankings don't all line up between the reviews and this test because each review was done by a different writer (we compared notes for this article). We all have our own personal preferences, and we use tablets in different ways, so it's all a subjective assessment. Finally: Full disclosure, I am an Android user. Somehow you'll call me an iFanboy anyway. I am prepared for that eventuality. The Nook HD has some nice things going for it on the hardware side. Most notably, the seven-inch screen is 1440x900, which nets you 243 pixels per inch, the highest PPI in this category. As a result, text is extremely sharp and clear. Magazines and graphic novels look terrific on it, as does HD video. It's also the second lightest and second narrowest in this category. That, plus its textured back, make this tablet the easiest to hold in one hand over an extended period. It's also the only tablet in this category that features a Micro SD card slot for expanding your storage—significant if you're downloading HD movies for a long, internet-less trip. You can hook it up to a TV and push video to it, but you'll need an adapter, which is sold separately. On the software side, it runs Android software (version 4.0, a.k.a. Ice Cream Sandwich), but virtually nothing you see would be recognizable to an Android user. This is a heavily-customized experience, the goal being to focus on Barnes & Noble's sizable library of books, video, magazines and other media. The experience is somewhere in between the Kindle's UI and Android's, and you can customize desktop spaces with apps, shortcuts, and widgets, which is handy for fast access to frequently used items. Downsides start with the thick plastic back, which makes the $200 device feel cheap, and almost toy-like. The screen, while sharp, has a distinct orange tint to it. The stereo speakers are both on one side, so when you watch a movie in landscape, you feel like you have blockage in one ear. Audio is quiet and tinny. No front-facing camera means no way to video-chat. The entry-level Nook HD has only 8GB of built-in storage (it's 16GB for everyone else), but the micro SD slot makes up for it a bit. The Wi-Fi radio struggled more than the others, and it doesn't have a 3G or 4G option available. It fared by far the worst in our battery rundown test, throwing in the towel after 4 hours and 20 minutes of streaming Nyan Cat (not that I blame it). To be fair, battery life seemed decent enough in daily usage, and it had very solid standby time. The more serious issues are on of the software. While it's certainly improved since the original Nook, it still feels cobbled together. There's a lack of consistency throughout the UI, which requires memorized behaviors, rather than just being intuitive. The biggest downside is the comparatively paltry selection of apps. Not only are there no Google apps (Gmail, Chrome, Maps, Drive, etc) but the apps from third-party developers are sorely lacking, too. Yeah, you can put widgets on your desktop, but there are hardly any widgets you can download from the Nook's app store. Some of the best tablet games aren't available here—but the tablet struggles under heavy loads anyway. Despite coming in fourth, it's worth noting that this is still a pretty good tablet. If you're already invested in the Barnes & Noble content ecosystem, you'll probably enjoy it. Everyone else, keep reading. • Dimensions: 7.65" x 5" x 0.43"
This generation of Kindle's improvements start with the hardware. The bright, seven-inch screen with 216 PPI is sharp enough for reading and viewing HD content. Everything looks really good on it. The stereo speakers are hands-down the best in the category. It feels very solidly built—thin, and with attention to detail. It uses MIMO for strong Wi-Fi even as you move away from your router. A handy micro HDMI port connects the Fire to a TV to stream HD movies directly. In our battery rundown test, it endured a full seven hours nyan cat to take second place. Like the Nook, the Fire HD runs version of Android that's really just a face for Amazon's gigantic content library. Amazon's app store is more robust than Barnes & Noble's (though weak compared to iOS and Android). The Kindle's big, important advantage is Amazon Prime. Beyond free two-day shipping on Amazon orders, Prime members get thousands of free movies, TV shows, and books. The Prime stuff may not be the widest selection, but it's a very sweet deal. Beyond content, some good software features include "Immersive Reading," in which an audiobook plays while highlighting the text on-screen as it's read. The solid build is at the beginning of the Fire HD's drawbacks, though—it's the heaviest, widest, least portable, and least comfortable to hold. The Fire's bezel is comically, ridiculously gigantic wasted space. You won't find a jacket pocket that it can fit into, which is mandatory for tablets in this category. The buttons are so flush with the body that you really have to fumble around (or, God forbid, use your eyes) to turn the screen on/off or the adjust the volume. There were performance lags throughout testing, and moving around just feels sluggish. The Fire HD does not have a cellular version or expandable storage. The worst offender, though is the software. It's good for media consumption, but whenever I needed to get something done, I found the Kindle (and Nook) extremely frustrating. Kyle aptly described the Kindle's software as more more like a backpack than a desktop—as you put more stuff in, it gets harder to find what you're looking for. Amazon did a good job of making things look good, but just because it looks good doesn't mean it is good. It can't even multitask. Amazon (and Barnes & Noble) ostensibly want to simplify Android, using a customized interface that's good-looking, but cumbersome, and wildly inconsistent. Basic Android 4.0 (Ice Cream Sandwich) is actually a lot more easy to navigate. Both of these first two tablets would have been a lot better if they just ran straight-up Android and added gigantic widgets to promote their content. (Note: People do root and install custom software on the Kindle and Nook for just this reason, but you have to know what you're doing). That said, if you just want a tablet for watching movies and reading, and you don't mind the extra bulk, this is your pick. It feels more like a $200 "media displayer" than a real tablet. But for the money, it's a really, really good media displayer. • Dimensions: 7.6" x 5.4" x 0.4"
From a manufacturing and design standpoint, the iPad mini is exquisite. It's the lightest and thinnest of the group, and it looks and feels like it's a generation ahead of the others (it isn't). The screen is the brightest of the group, and it's the only one with a 4:3 ratio. Speakers are the second-best behind the Fire HD. With basically has the same guts as the iPad 2, it's roughly as quick and responsive. The Wi-Fi radio performance is solid, and if you pay more for a cellular radio (and a data plan), you can run that at LTE speeds. Also, did I mention it's good looking? The mini runs iOS 6, and its stark minimalism and gesture-based shortcuts are familiar to anyone with an iPhone or iPad. The device is a giant folder for apps, and iOS is unequaled in that arena, with more tablet-optimized apps than any other mobile OS. Android has more apps, total, and they stretch for tablets, but the iOS apps are generally of a higher quality. Because of Apple's comparatively tight regulations for developers, the UI feels more cohesive across applications. Apple also has a ton of content to choose from—music, movies, books, and magazines—though prices are typically higher than they are in the other ecosystems. What holds it back is the hardware. 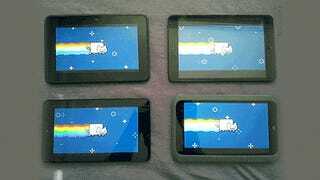 The brightest screen in the test has easily the worst resolution, with measly 163 pixels per inch, versus 216 PPI on the Kindle Fire HD and Nexus 7. You can see with the naked eye, especially when reading. It's obnoxiously reflective, and, in general, a big disappointment. The 4:3 ratio is nice for web browsing, it is awful for watching movies. Gigantic black letterbox bars take up almost as much of the screen as the picture. It's also just too big. The width plus thinness meant I never got comfortable one-handing it. I always felt like it would slip and fall (and I have reasonably big hands). Good luck skipping it into a coat pocket. On battery life, the iPad mini was second-worst in the test, coming in at 6 hours 35 minutes. Then there's the software. It seems like Apple said, "Eh, we'll just shrink the iPad, but keep the ratios the same, and all the iPad optimized apps should work just fine." Holy crap, they do not. As Brian Barrett said in his review, "If you have iPad magazine subscriptions, you should cancel them before you squint yourself to death trying to read the tiny, non-adjustable typefaces here. Ditto comic books." Also, the buttons in the iPad apps have shrunk too, leading you to tap and tap until your touch finally registers. Same with the keyboard. It's infuriating. There are a lot of websites that the Mobile Safari browser doesn't play very nicely with. Settings generally take more clicks to get to, apps easily get lost in the homogenous-looking home screen, and there isn't much in the way of customization—if you don't like the way that Apple has decided something should be, you're stuck with it more often than not. All that, and it costs $130 more than the other three. But if you already have an iPhone, and you love it, the iPad mini will probably make you happy, eventually. But I'd wait at least until Apple optimizes its core apps for the smaller screen. We were torn between putting this in second or third place, but it beat out the Kindle by simply being able to do more, and by being able to do it faster. • Dimensions: 7.87" x 5.3" x 0.28"
The Nexus 7 has an understated look. The bezels on the long sides are extremely thin, making it the narrowest of the small tablets. It fits into the pockets of most jackets (and jeans, not that I'd recommend keeping it there). The most portable, it's also the second-heaviest, but the evenly distributed weight makes holding it in one hand a nice experience. The seven-inch 216 PPI screen is very good. It's not the brightest (iPad) or the sharpest (Nook), but text is super clear and video is very sharp. The Nexus 7 aced the battery rundown test, at 9 hours 1 minute, stomping the second best by two hours. With a quad-core 1.5GHz Tegra 3 processor and a gig of RAM, it has the best guts of the lot, and even the most graphically-intensive games and apps open quickly and play smoothly. Also smooth: The OS. The Nexus 7 runs Android's new version 4.2 (Jelly Bean), which is an extremely fluid experience. Settings, notifications, and multitasking are rarely more than a click away. Jelly Bean includes Google Now, which tells you when you need to leave for meetings and how to get there, updates sports scores, or alerts you if your flight is delayed. The keyboard is the best I've used on a mobile device (70 percent of this review was typed on it). Google's voice-to-text works astonishingly well, and you don't even need an internet connection to use it. iOS may have more tablet-optimized apps, but because Android devices come in so many different sizes, developers are used to scaling. Text and buttons are human-sized, and zooming in and out to view things is simple. Google has a ton of books, movies, and music, often at lower prices than its competitors, and you can store up to 20,000 songs for free in the cloud to stream on any device. It has the best integration with Google services like Gmail, Calendar, Voice, and Maps (though iOS is now nearly as good). Chrome is the best mobile browser I've used, and it syncs with Chrome on your desktop. Plus, there are a lot of really great games available. The biggest hardware drawback to the Nexus 7 is the speaker. It's just ahead of the Nook HD in terms of volume and sound quality, but it has the same annoying one-sided placement. It's solidly built, the plastic back feels cheap next to the Fire HD or the iPad mini. The Wi-Fi radio is definitely not as strong as the Fire's or the iPad's; it struggles as you move away from the router, and speeds aren't as high, either. No expandable storage is a bummer, as is the lack of an HDMI port. If you feel like springing for the cellular version, you'll be limited to HSPA+, aka "faux-G," which is not as fast as the LTE on the iPad mini. On the software side, something weird happened when the Nexus 7 upgraded from Android 4.1 to 4.2. Speed got less consistent—usually extremely fluid, but with sudden, jarring lags for no reason. Android still lacks visual coherence, and UI flow is inconsistent. The unpredictable "back" button will sometimes take you back a page, and sometimes it'll close out of an app. You sometimes get a force-close or an error, and you'll have no idea why. Then there's the app situation. Companies still tend to develop for iOS first, and then Android. Frequently, the Android app isn't as good as its iOS counterpart. Either it doesn't look right, or some functionality was cut out. This situation has certainly improved, but it's definitely still a thing, and if you're wanting to stay up on the latest trends in mobile apps, you may experience some iEnvy. All that said, the Nexus 7 is a legit, high-performance tablet for 200 bucks. In fact, it's the only one of the bunch that feels like a high-performance tablet. Regardless of whether you just want to consume media, or HD games, or actually really get stuff done, this is hands-down the best and most versatile of the group. • Dimensions: 7.81" x 4.72" x 0.41"
Were you looking for the best full-size tablet? Here it is!